Maybe it's a little strange that we haven't reviewed any Cantillon beers around here, given that they're pretty much the most sought-after sours on the planet, at least as far as I can tell...which is probably a big reason why we haven't reviewed them- they're in such high demand that they disappear from the shelves instantly. Cantillon's process is about as traditional as you can get, including the use of a coolship- basically a huge open copper baking pan into which wort is pumped to chill overnight, allowing all sorts of bacteria and wild yeast to wander in looking for snacks like a Hot Pocket-crazed stoner. Most breweries try their damnedest to avoid exposure to the ambient environment and long chilling times, but at Cantillon, the coolship is where the beer begins to get its character. 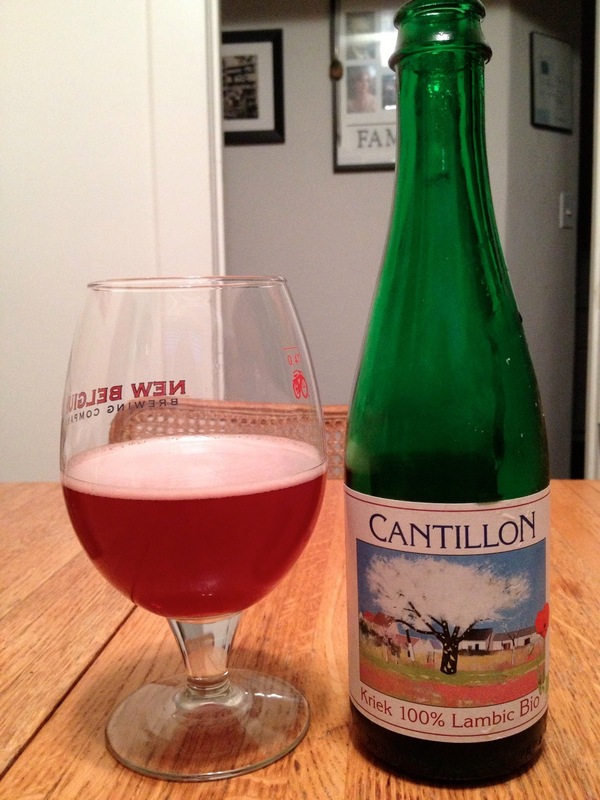 It has that cherry juice- or cough syrup-mixed-with-beer look common to a lot of krieks/lambics. The carbonation level in traditional sours seems pretty variable (whether intentional or not), but there's some decent bubbliness to this one judging by the head. It smells incredibly floral, almost like there's rose water added to it. There's a nice sourness (as expected), and it comes off almost ginger-beery, albeit with some cherry juice added, for obvious reasons. It also smells very clean, with no interference from anything that could be called "off". The flavor's nicely puckery, but it's not as sour as I'd expected, or as I remember Hanssens being. There's a bit of brettiness that adds a nice yeasty complexity to the party. It's fruity, but initially in a non-specific way (i.e. the cherry flavor doesn't blast you right of the bat)- as it warms, the cherry comes out a lot stronger. If you mentally separate the sourness from the other flavors, there's almost a Jolly Rancher or Tootsie Roll Pop cherry candy aspect to it- obviously not as sweet, but sort of reminiscent of the flavor. At the end, a little salt component comes in...John said he thought it tasted like olives; I didn't get anything that specific, just some salt. As the bottle says, this is a really good thirst quencher of a beer. And as expected, it was a perfect palate cleanser. Delicious, sour, and extremely clean. And while the base flavors are simple and approachable enough to just sit back and enjoy it, there's also enough complexity to warrant taking your time to dig around looking for buried treasure.